china experienced its harshest winter in five decades in the last week of January. Snowstorms battered the country, disrupting power supply, air and domestic transport, claiming scores of lives. Heavy snowfall hit the country when an estimated 200 million migrant workers were heading home for their most important Chinese new year holiday. On January 25, the government issued a severe-weather alert and deployed over 450,000 military personnel for rescue operations. Transportation disruptions brought in heavy shortages in coal supply, affecting power generation of more than 36 million kilowatts. The state economic planning agency said nearly 2,300 mines were operational through the Chinese new-year holidays to compensate for the coal loss. On February 7, the state media reported that power had been restored to 164 of 169 counties in swathes of central, southern and eastern China. The blizzards had hit these areas severely. Chenzhou, a city in central China, among the areas hit the hardest, faced a complete black-out for more than 10 days. 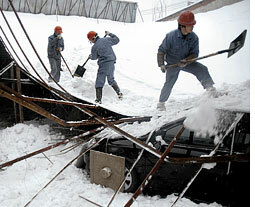 About 1,000 electricity poles had collapsed around the city due to heavy snowfall and destroyed the power grid. "Reducing vulnerability to these unexpected extremes must be a top priority for governments," said Salvano Briceno, director of the un secretariat of the International Strategy for Disaster Reduction. But Chinese weather experts have said the snow storms are not linked to climate change. They said it was just an extreme event triggered by very cold winter temperatures and the ocean-atmospheric phenomenon called La Nina. The phenomenon has brought moist air over southern China at a time of very cold winter temperatures, resulting in snow fall, said Dong Wenjie of the national climate centre. Many countries and agencies have come up with aid to help the victims. who has put the total economic loss at about us $11 billion.